I'm an Australian writer of short stories and novels. Having spent many years bringing up a family and working, the urge to write fiction didn't hit until 1999, when I wrote a short story and found the experience so enjoyable that I wrote another and another and, well, let's just say I've got quite a big pile of them now. And, to my amazement, lots of those stories have won awards and have been published in Australia, New Zealand, UK and Ireland. The Australian publisher Ginninderra Press has published two collections of my stories - "Once More With Feeling" and "Salt & Pepper". 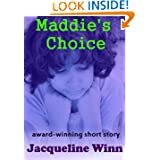 Some of my prize winning stories are also available as mini eBooks on Amazon. I've also written two novels, a handful of poems and quite a few scripts, mostly for stage and most of which have been performed by various theatre groups. I was born in Derry, Northern Ireland, but moved to London when I was little. Then my family migrated to Australia when I was ten-years-old. Having lived in Sydney for many years, my husband Brian and I moved in 2004 to our farm at Possum Brush on the mid-north coast of NSW, where we have cattle, goats and chickens, plus a little orchard and a big vegetable garden. I love to ping-pong back and forth to Sydney to spend time with my two children and their partners as well as my three lovely grandsons. Often, writing and community groups invite me to give workshops on creative writing and I also mentor High School students writing short story for their major works. So, that's me - family, farm and writing. A fine life, I must say.